← Films or Filmmakers — where does the problem lie? No one can really teach someone how to make a “great” movie — greatness arising out of the unexpected, the serendipitous, and those hard to quantify flashes of genius. But one can suggest ways to make films “better”. Rules — or at least guidelines — for making “good” films. And maybe that’s the key. Struggling filmmakers should first worry about making good films…and, with luck, the greatness will follow on its own. With that said, everyone has their own particular idea of good, bad, and indifferent. And the purpose of movies vary. A filmmaker who is making a, to him, profound treatise on mortality is going for something different than a filmmaker who has made a wacky comedy; an “Art” filmmaker, who has made a film playing around with the very form of cinema, isn’t necessarily hoping to elicit the same response as a filmmaker who has made an action-thriller. Which kind of relates to what is the very intent fuelling a lot of Canadian movies. Because budgets are small and access to theatres and distribution uncertain, a lot of Canadian filmmakers will claim they never intended to make a populist film. After all, why make a mainstream comedy or thriller when you know it probably won’t get the distribution or marketing it needs, and is liable to get swallowed up in the market place? If you make a little indie film, at least you stand a chance of generating buzz on the festival circuit. While those who claim they are trying to make a populist film will then sneer at anything creative or challenging (including Canadian identity) as being something that stands in their way of the big box office. (Though what unites both groups is the belief that they, as individuals, and their personal success is more important than any higher purpose…like helping to build a successful Canadian film industry). But although there is something to be said for the “let’s conquer the film festival circuit, not the box office” mentality — that’s only if it’s a first step. The goal must be to eventually create a populist industry that brings in money, otherwise, what’s the point? You’re dooming the entire industry to an endless cycle of discussions about art vs commerce, and derision from the very countrymen you purport to represent who feel the film biz is just one expensive make work project for a bunch of self-indulgent elites who brag about their cultural worth every time they win an award or get a write up in a trendy New York paper…and then, if the notices are bad, and the awards not forthcoming, smugly turn around and say reviews and the opinions of others are irrelevant because they are artists! But whether you are making a “small” film for the festival circuit, or hoping to make inroads into the mainstream, there are still general ideas that can be applied to films across the spectrum. So in that vein, and having sat through a lot of movies over the years, as I have — a lot of good films but, perhaps more important, a lot of mediocre, and even bad, films — here’s a little list of things to note, rules — or guidelines — for cinematic storytelling. And chances are, most people reading this will say: “Dude, these are all pretty obvious comments.” And they are — yet somehow, they often seem to get lost in the rush, and the pressure, to make a movie. So if you’re a filmmaker, feel free to print this up and tack it on your fridge, as something to look at every morning before you start work. Or if you’re a film fan, feel free to send this on to the filmmaker of your choice. Movies are a mass culture product. Period. So you aren’t making them just for you and your friends. If you want to do that, become a painter, or a poet, or start a blog…something that doesn’t require a huge investment of other people’s capital. Movies cost money, and they have to try and recoup that money. Look at it pragmatically: every time you make a film that bombs, and you shrug and say “I’m an artist — commercial concerns are anathema to my artistic process,” you make it that much harder for the next Canadian filmmaker to get funding. And that next filmmaker might well be you. Movies should, first and foremost, be storytelling — so there should be a plot. Something that has a beginning, middle, and end. Unfortunately, plot is one of the hardest things to craft. That’s why so many Canadian movies eschew a clear plot for vague themes (coming of age), episodic narratives (road trips), anthology/ensemble formats (where the movie’s really stitched together, like Hollywood’s version of the Frankenstein Monster, out of a bunch of shorter stories none of which have to sustain 90 to 120 mins.) Now there’s nothing inherently wrong with any of those — some great movies have used those formulas. The Canadian movie Lunch With Charles was a “road trip” film but, as I recall, it was still wrapped around a plot, with twists and turns. But too often these formulas can smack of a filmmaking crutch. As well, if you’re trying to sell your movie in the market place (or even hoping someone will look at it twice on the DVD shelf) it helps to actually have something that can catch people’s attention, a plot description that makes people say: “Hmmm, this sounds interesting…the description makes me intrigued to see how it all turns out.” With that being said: you want a plot that can be described in a few sentences…but a few sentences shouldn’t be able to describe the entire plot. The description should make the viewer want to see your film…not to feel like they just did! In salesmen circles they say ABC — Always Be Closing (at least, y’know, they did in Glengarry Glen Ross) so in filmmaking circles we can say ABMF. And, no, the M doesn’t stand for “Muther”. Rather, it stands for Always Be Moving Forward. A movie is comprised of scenes, and the scenes should build upon each other to tell your story. Obviously, there will always be extraneous scenes, filler scenes, or scenes that exist just to add to the milieu, or exist for a gag, or just because they are good scenes. But in general, scenes should push us forward, whether it’s pushing the plot forward, or expanding upon our understanding of the characters (and, ideally, both). I can’t tell you how many movies I’ve sat through where you have scene after scene that isn’t contributing to either the plot or the characters, that essentially just reiterate earlier scenes — indeed, movies where you could literally re-arrange the order of the scenes and it wouldn’t actually affect the flow of the movie. Perhaps a good rule of thumb is if you randomly pick a scene, and you can’t immediately pin point what Act it appears in…your movie isn’t progressing. One of the biggest problems I find in my long years of watching Canadian films is they tend to be too slow and too long. And I’m talking about movies that both start out slow and tedious…but equally movies that I’m enjoying, that I think are really good…but as the minutes tick by, and the half way point looms, I’m squirming in my seat and looking at my watch. And strangely, often it seems this is relative to the running time. In that, I don’t just mean I see 2 hour movies that could be edited down to 100 mins, I mean I’ll see even relatively short films — 87 mins, say — that feel like they need cutting down to 70 minutes. This relates to my above points about whether scenes are contributing to the overall movie. A movie can get tedious if you feel that too many scenes are just filler…literally existing just to boost the running time to feature length. But as I say, even movies that do have enough to justify a solid 90 minute feature, can still feel slow because the final cut is 120 minutes. Sometimes it’s that scenes should be cut out — sometimes the scenes should be left in, but need to be tightened, leaving out the pregnant pauses and the extraneous business which is irrelevant to the significance of the scene (showing a character walking down the street to a meeting…when it’s the meeting itself that’s important). Again, nothing is absolute. After all, in a comedy, if you cut out all the extraneous bits that weren’t relevant to the plot…you might cut out half the gags! 2001: A Space Odyssey is a long movie with lot of slow and even pointless scenes…yet those scenes are what create its atmosphere. Edit 2001 down into a tight 90 minutes…and it wouldn’t be 2001! Heroes in stories are, let’s be honest, generally better than real people — nicer, more thoughtful. They are who we would like to think we are, more than who we are. I don’t believe Hollywood writers are any nicer than Canadian writers…but they know how to fake it better in their scripts. To be fair, sometimes part of it can get down to casting: some actors just project a likeability and some don’t (even if they are, in all other ways, equally talented as performers). But I just can’t stress enough how many Canadian movies I’ve seen where a major flaw is that I really don’t enjoy spending time with the characters, or empathize with their behaviour. And this applies equally to serious, thoughtful, Art House dramas…and pulpy, straight-to-DVD action movies and horror-thrillers. Which maybe is a good point about characters: it’s not just enough to show a character behaving a certain way, you have to show us why they are behaving that way. In one of my reviews I used the phrase: “Anyone can tell you something happened…a story teller tells you why.” And I stand by that. So how do you make a character sympathetic? Well…make them nicer, make the characters themselves more compassionate and empathetic toward others. Cut back on the rage, the tantrum scenes. Cut back on vulgar and abusive language (profanity has its place, but not in every line). Cut back on the infidelity (you may cheat on your partner, but that doesn’t mean your character should). Remember that though you and your friends might get a kick out of mistreating animals, most of your audience doesn’t. And this applies to supporting characters as well as lead characters. Heck, I’ve seen action movies that are ruined because even though the hero might be, nominally, sympathetic…for some reason the villain gets most of the dialogue and screen time, and he’s a one note, sleazy, sadist, all his scenes involving him doing cruel and sadistic things to people, and apparently the filmmakers dig that (watch Die Hard and there’s no doubt that Bruce Willis is the main character, not Alan Rickman). Mordecai Richler Barney’s Version was a high profile movie based on a famous novel, but my impression is it still underwhelmed at the box office (despite giving all the best roles to American and British imported “stars”). I’ve never read the novel, but I saw the movie, and even heard an earlier radio adaptation…and I’m still hard pressed to even say what it was about. Some people loved it…but a lot of other people, well, they didn’t so much hate it, as they were just bewildered by it. It’s a comedy-drama-romance, yet with next to no scenes (or even lines) I recall as that funny, and lacking a true romantic core, and with a plot that just seemed to ramble about with no real focus. The movie is basically about a chain smoking, heavy drinking guy who is unfaithful to the women in his life…and fans of the story seem to cite their love of the main character as its main appeal. And, to be honest, though a number of Mordecai Richler stories have been turned into movies, all have underperformed, and all — even ones I kind of liked — I’m kind of hard pressed to really say what they were about. Or consider Margaret Laurence’s The Stone Angel — a famous novel by a famous Canadian writer. In this case, I haven’t read the novel, or seen the movie. I might very well love the movie if/when I see it. And looking at some message board postings, fans of the novel seemed to feel the movie was a faithful translation of the story. But just going by the basic premise, the story seems to be defined as “the decades spanning tale of a woman unhappy with her life who makes everyone else unhappy around her”. Now maybe that’s not it at all, but I’m just going by what I infer from things others have written (and in movie making, perception is important…’cause that’s what gets people into the theatres). And I mean, really — does that synopsis sound like box office gold? That should be a mantra filmmakers have to recite to themselves in the mirror every morning. I know it sounds harsh, but it’s important to chip away at the egos too many filmmakers have armoured around themselves, their heads so inflated they are in danger of breaking their own necks. I think part of what got me thinking about this was all the times I’ve seen interviews with filmmakers where they describe their films by saying: “I wanted to explore this ___ (fill in the blank) theme.” They wanted to do something about relationships, or other aspects of the Human Condition. And that’s great, that’s wonderful, I’m all for that…but the problem is, what if the filmmaker doesn’t know anything about the Human Condition? What if a person who spends all day on a film set, or months at a time locked in a dark editing room with a guy named “Gus” doesn’t have the profound insight into real people he thinks he does? Yes, of course your film should have underlying themes, and deeper meaning…but don’t necessarily presume that you have something to tell me that I haven’t already figured out on my own. You’re making a movie…not delivering a Massey Hall lecture. What if — God Forbid — your audience actually thinks they might be smarter than you? What’s your fall back position? Better to say: “I made this movie because I thought it’d be really entertaining. It’s funny. Or exciting. Or scary. But as I was working on it, I realized it was bringing up some interesting themes about human relationships”. Remember, at the end of the day, your characters can only represent themselves, not society as a whole. You don’t have to go through the motions of churning out formulaic pablum. Of course your film should touch you on a deeper level, and you should put something of yourself and your beliefs in your movie. A big problem with movies can be — and this relates as much to “serious” movies or Arty movies, as much as made-for-TV programmers — is how generic they can seem, lacking a real sense the filmmaker is bringing anything personal to the story by giving the character a quirky hobby, or a profession that actually seems relevant to the narrative, or anything. The American filmmaker Paul Thomas Anderson once was quoted (I think it was him…I don’t actually have the article in front of me) as saying that although he liked making difficult, challenging movies that sometimes left audiences scratching their heads…he wouldn’t actually want to watch his own films. And I sometimes wonder if that’s a problem with a lot of Canadian movies. Filmmakers who are so consumed with the process of filmmaking, convinced of their genius and the profound themes they are trying to explore (see my above points), so focused on crafting something that will get them a slot at a film festival…they often make movies even they wouldn’t really want to spend an evening of their lives watching. And even when they praise a fellow Canadian filmmaker’s work, they do so because they are admiring the craftsmanship of his work, as a fellow auteur, rather than because they truly liked the film. Now with that said, as some of my earlier points have mentioned, you also have to step outside yourself, and remember you aren’t just making movies for your own enjoyment, but for an audience — hence my point about not being an a**hole which brings us neatly back to my first point: (1) you aren’t making films just for you. And let me add a few final points — less “rules” and more observations. i) Even dramas benefit from humour. Heck, some of the best, the funniest scenes and lines are in otherwise serious movies. A little wit and whimsy can enliven an otherwise self-consciously self-important melodrama. ii) “Artiste” type filmmakers will often brag about how important their films are, how they are deeper and more profound than crass Hollywood films…yet it’s curious how often “serious” Canadian movies are a-political. For all their claimed profundity, they rarely deal with (or even allude to) real world issues, social or political matters. They are surprisingly…safe. But I guess that’s how you win at film festivals. Heck, ever noticed how curiously monochromatic the casting is in serious, art movies? So — there you are. Ten golden rules. Ten at times contradictory rules. But that’s because, as I’ve said before, there are no absolutes, and it’s somewhere in the middle that success lies. These rules are almost less about telling filmmakers how to make a movie…and more about getting them to think damn hard about the choices they do end up making. This entry was posted in Canadian film and TV. Bookmark the permalink. Always enjoy your articles. Insightful and enthusiastic–the latter a quality many Canadian films do not exhibit, in my experience. Canadian films tend to lack a sincere kind of passion–its something the films in other countries usually have(or did have) by default. I also wonder if our filmmakers watch non-Canadian films not because they like them but just because it happens to be in easy reach like a bottle of Coca-Cola and its not motivated by real interest in these films or understanding of what makes them tick. That would also be an act of passion–being enthusiastic about them. The Brood, a Canadian-made film I rather like from the tax shelter period, is partly about a clash between people who are rather unemotional but considered normal and those who are overtly passionate(interesting that the actors playing the “prime mover” parts of the doctor and star patient are foreign but I know they needed to make it marketable). Another film from the era which is not Canadian but is set in Canada–Death Hunt, uses points you mention, and if it were made by Canadians, would have tossed them aside. For one, the mad trapper is compassionate-he breaks up a dog fight gambling event. If this were a Canadian-made film he may well have been a participant in the event or laughed it off as good fun or stopped someone else from attempting to intervene out of a multi-cultural political correctness. Secondly, Lee Marvin’s mountie character advises Charles Bronson’s trapper that if he doesn’t surrender to him he cannot guarantee that the other trappers will not kill him. Marvin calls them “savages.” If this were Canadian-made, the use of that word would have been seen as awfully inappropriate, especially from a police officer. Again–it is about passion. I find that in Canadian films the characters don’t show real emotions or behave in ways that you can easily identify with. Its a lack of sincerity. Why it is like that I don’t quite grasp. Is it the climate? I discovered a Canadian propaganda radio drama from WW2 starring Vincent Price some time ago where he has to deal with a Japanese invasion of British Columbia and he ultimately throws his overseer into a rock grinder. 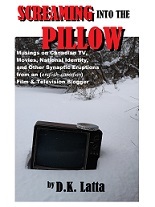 Perhaps it was just an anomaly of wartime or the creator of the show was not from Canada–but it felt out of whack with what I have observed in Canadian film (and literature–which is another subject entirely). A sterile, aloof style seems to be deliberately adopted by many Canadian filmmakers — and, as you say, not necessarily to good affect. Passion — for characters or ideals — being a bedrock of good drama. Although I would suggest that “political correctness” is often just a term we all use to dismiss something with which we personally disagree. Your point about animals (and I agree with you) could be dismissed as “politically correct” by a non-animal lover. Personally, I found that Price episode of Nazi Eyes on Canada a mite racist (even allowing for the wartime propaganda aspect). But Canadian film could maybe use a little more sincere “political correctness” and filmmakers willing to take moral stands, instead of making movies that rarely seem to be about anything. I have seen 70s era exploitation films like Walking Tall or Truck Turner where the death of a dog or cat is used as a plot device and emotional focus for the audience and this despite considerable violence against humans in the story. Death Hunt isn’t on my top ten list, but it is a noteworthy example of a Canadian-set story which Canada would likely not make (even without the more sensational invented elements it could make a compelling story). I do not think the minority of dog fighting supporters would have the vocabulary to describe the compassionate intervention as “politically incorrect.” I should have put it in quotations in my original comment. Dog fighters would likely be verbally abusive (but passionate) instead. The term is more likely to be used by a stereotypical Canadian academic (perhaps the same variety that would defend a documentary about three students who tortured a cat to death as an art project). The attitudes towards the Japanese overseer in the propaganda show I can’t comment on since I haven’t seen or heard anything else from the era with that kind of scenario–I have seen some WW2 propaganda which portray all Germans as robotic followers of Hitler however. I only mention it because it does not feel like a Canadian program at all due to the aggressive/passionate actions of the main character as well as the idea of Canada being invaded. Even his dislike of his Japanese customer is an act of passion. In Canada it feels as though any kind of passionate attitude would be suppressed, even if the character is an antagonist in the drama. But as you point out in your Animals fer the Killin’ in Canadian Entertainment essay, they would likely include some kind of nonhuman victimization for humor. It wasn’t uncommon for a difference in portrayals of Japanese when compared to Germans in WW2 propaganda-(although bombs were dropped on both)-on the other hand, if one watches the Disney short Educated for Death, the Germans are portrayed as brainwashed zombies. War propaganda is always going to be offensive. The Canadian example is probably about the same as what you would expect from the US. Unfortunately, the US was also making quality entertainment programs while Canada did not.